This week is Little E’s preschool Halloween party. I’m sure many of you with children in preschool or elementary school are also preparing for Halloween or Fall parties. Some of you may even still be trying to come up with some cute snack ideas. 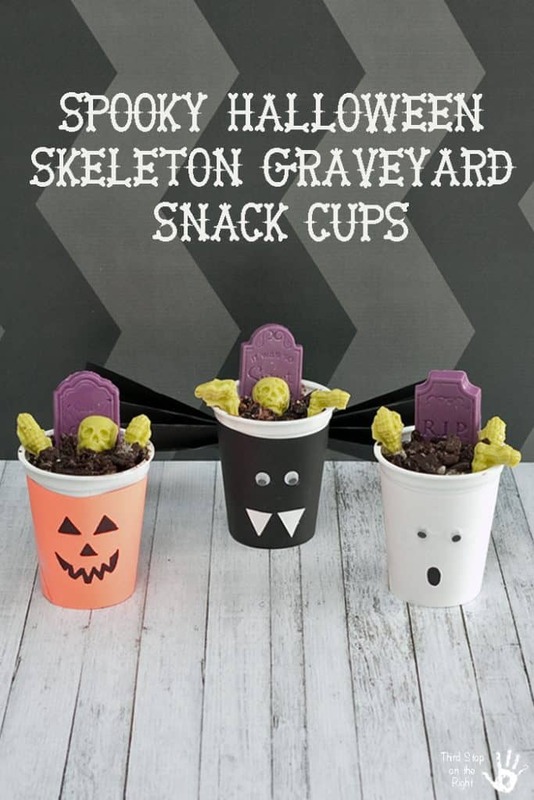 If you still need some snack inspiration, check out these cute graveyard snack cups. I made them with Snack Pack pudding, “Go-Paks!” snack cups, candy, and molded chocolate. The best part is that they are easy to make and cost less than $2 per cup, so they are perfect for taking in to class. The “Go-Paks!” come in a number of varieties including NUTTER BUTTER bites, Chips Ahoy! Mini Chocolate Chip Cookies, Mini OREO Golden Sandwich Cookies, Mini OREO Chocolate Sandwich Cookies, TEDDY GRAHAMS Honey Graham Snacks, RITZ Bits Cheese Cracker Sandwiches, and Mini NILLA Wafers. When you combine these “Go-Paks!” with the many options of Snack Pack pudding such as butterscotch, vanilla, chocolate, lemon and more your possibilities are endless. I chose several different varieties but if you are taking them in for a class, you might want to buy the same variety for everyone! 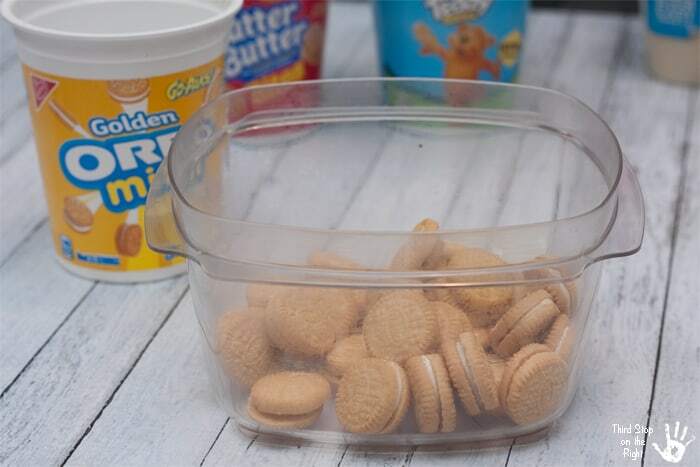 I began by opening one of the “Go-Paks!” containers (this one was the Mini OREO Golden Sandwich Cookies) and emptied it into a separate container. Then, using a spoon, I crushed up the cookies). After crushing up the cookies, I opened a pack of the vanilla Snack Pack and emptied it into the container with the crushed cookies. I then mixed both together. 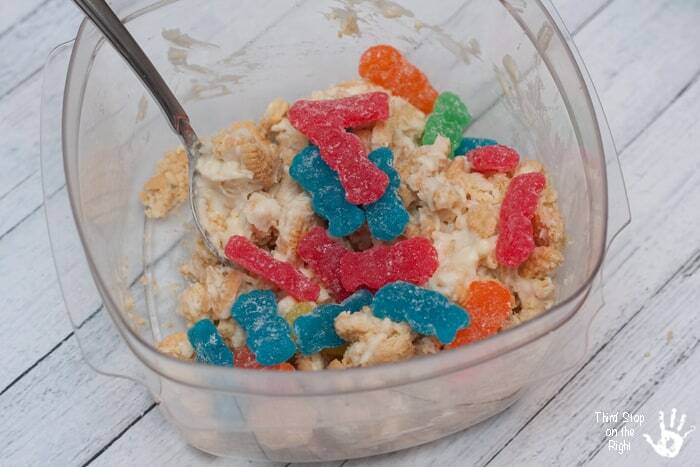 I also added in some Sour Patch kids. 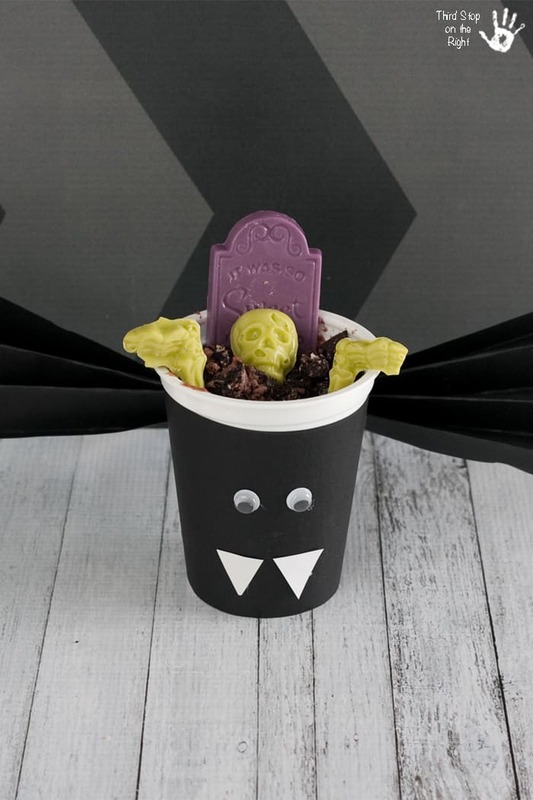 It makes for a bit of a spooky surprise when you eat the cookie cup! You will then want to put the mixture back into the “Go-Pak!” cup. 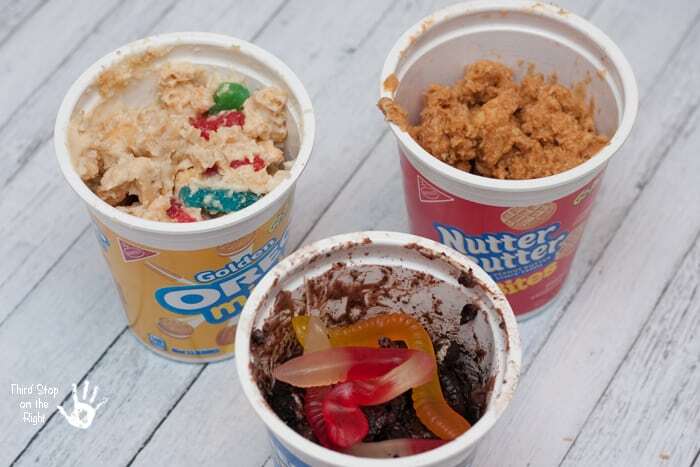 There are lots of options when it comes to making these cookie cups. 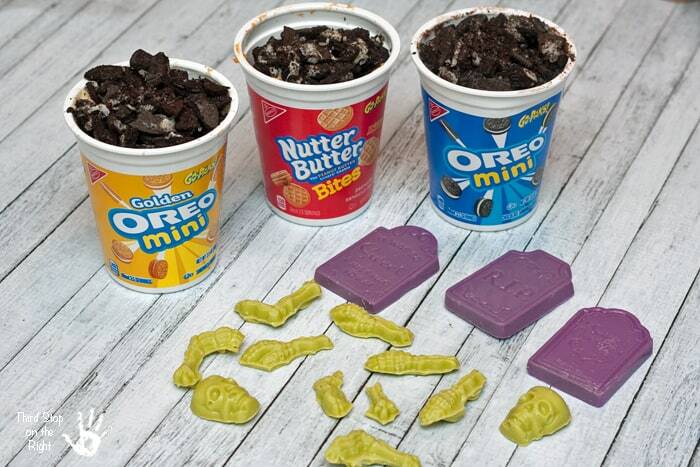 For the OREO Golden Sandwich Cookies I used the Sour Patch Kids candies and vanilla Snack Pack pudding; for the OREO Chocolate Sandwich Cookies I used gummy worms and chocolate Snack Pack pudding; and the Nutter Butter I just used butterscotch Snack Pack pudding with no candy. 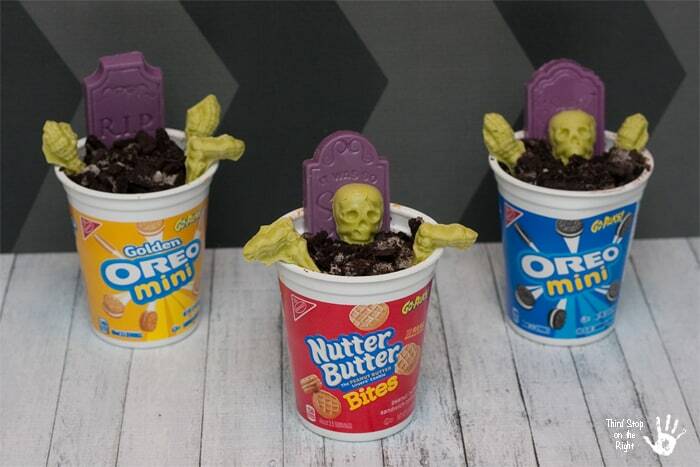 Since this is a graveyard-themed snack cup, I put a layer of crushed, chocolate OREO cookies on the top of each of the cups to make it look like dirt. Earlier, I had made some molded chocolate candy in the shape of tombstones and skeletons. I put the tombstones into the cups and then positioned the skeleton parts so that they were sticking out of the ground. The final part to this project was wrapping the outsides of the containers in some fun Halloween decorations. I chose to do a pumpkin, bat, and ghost, but you can choose anything you want. All you need to do this is some construction or scrapbook paper, black marker, and some tape. You can also use googly eyes if you want. Since the wrapper will be shaped somewhat like a coffee sleeve, you will want to use this template that I created. Just print it out and trace it onto the paper you are going to use for your sleeve. It is easier if you decorate the wrapper and then attach it to the container. You are going to want to wrap the sleeve (curved side toward the top) around the outside of the “Go-Paks!” container. Tape it so it stays secure. Now you have an adorable treat to take to school for you child’s party.